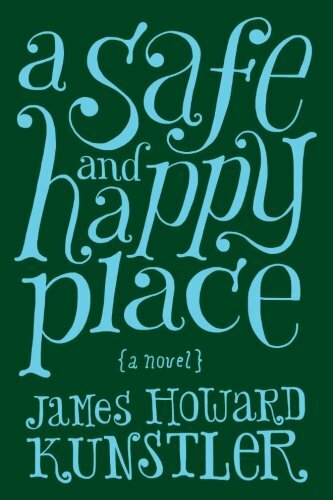 Order here and you will receive an autographed copy of James Howard Kunstler's newest novel, A Safe and Happy Place. So begins the journey into adulthood of 19-year-old Erica “Pooh” (as in Winnie the) Bollinger from Oyster Bay, Long Island. She’s a sophomore at NYU and nothing is working out there. She’s knocked up. She hates the city. The Vietnam War is making America crazy, not to mention the sit-com looniness of everyday existence on the home-front. Pooh desperately wants out. She hears about a magical place up in Vermont where you can leave all this crap behind, a commune called Sunrise Village founded by the mysterious, charismatic figure known in the hippie underground only as “Songbird.” Maybe she ought to go up there and check the situation out. . . .
James Howard Kunstler is the author of 19 books, including "The Geography of Nowhere" (Simon & Schuster), "The Long Emergency" (The Atlantic Monthly Press), "Too Much Magic" (same), and the four-volume novel series "World Made By Hand" (also The Atlantic Monthly Press). Mr. Kunstler was an editor at Rolling Stone Magazine in the 1970s. His journalism has appeared in The New York Times Sunday Magazine, The Washington Post, The Atlantic Monthly, and many other publications. He is going "off the reservation" with this experiment is self-publishing on CreateSpace.